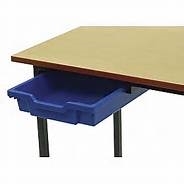 Robust square and rectangular fully-welded nursery table with an MDF laminated top and with plastic tray(s) on runners. 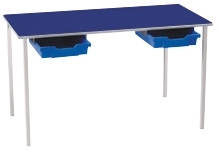 An ideal table or desk for the nursery school, pre-school, play school, early years classroom, primary school, and other childrens educational environments. 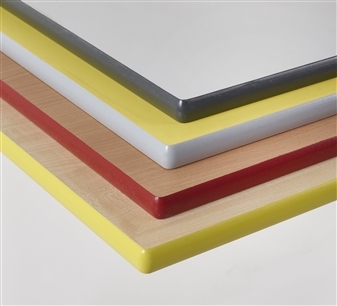 The table top comes in maple, oak, beech, blue, red, grey, yellow, green, white & black laminate finishes, and the trays come in red, blue, green, yellow, or translucent. The tables come in 3 heights, with PVC edge and with a black or grey epoxy powder coated steel frame.